call around your local city, for nursing homes, they are always looking for lapghans, I can't keep up around here with it! Or some vets home, or here on the ville, several people would be happy to add them to their donations to a favorite charity! I am kind of like you except I don't have any pieces done lol, but I have no clue where I would send things that I would do for charity except to people here. I'm not familiar with my town's outreach programs or anything except for the no kill animal shelter and the humane society. I've always been intrigued by making something, selling/let org. sell, and having the money for the org. I dunno. I did want to say that I appreciate your effort to give to people through your lapghans. You're a very thoughtful person! One central source for info about local charities would be the United Way. There should be a local office of United Way in most areas. Or just look in the phone book under Social Service Agencies. I think that one big benefit of donating locally is that you don't have to box up the items and then pay a lot of postage to get them to their destination. Oh kathy, i donate locally, and forget that postage, most places come on out and get it when I call um, lol I only deliver a few miles away, there are two local nursing homes nearby, and then if they, or any of the other places I donate to, want to share the wealth, I leave it up to them, to ship it out on thier buck. Most just keep what i donate, as I can't seem to keep up with them all, and goods are always sooo appreciated to these places. I donate to many chairities locally, gave up that whole idea of paying postage to some group on the east coast, or west coast, when it is so needed right here in my own home town! I do when I can however, donate to people's causes here on the ville now and again, like i said, no matter how you do it, or to whom, someone is going to appreciate your efforts! I have done locally and do have a few fav charities that sort of "talk" to my heart and touch me in a moving way, and that requires I mail the packages since it is too far for pick ups or deliveries. But it's ok, cause I build up stock on those and only mail once or twice a year. 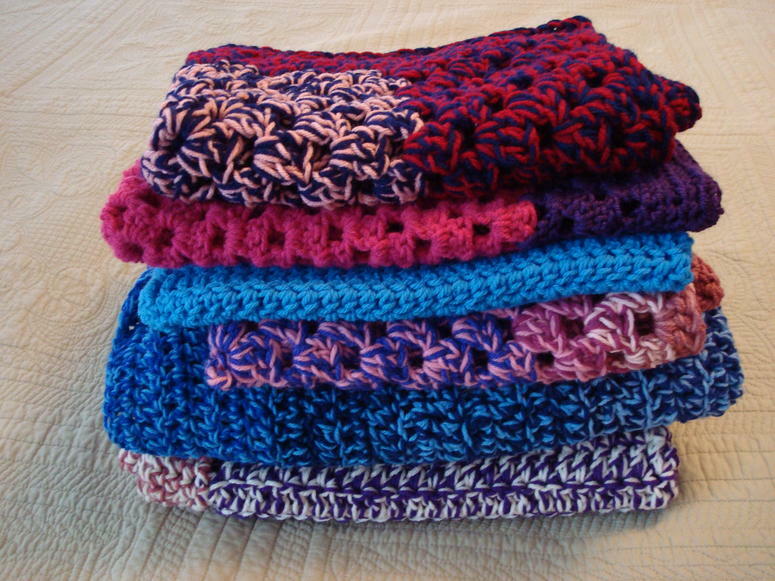 Many of the crochet sites, and yarn sites will list charities they endorse. And as stated by others, check your local shelters, hospitals, and phone book. When contributing to child oriented charities, make sure you have a copy of their local requirements, as many have strict rules regarding size, structure, yarn type and even their own patterns. I wholeheartedly agree with donating locally. The cost of postage is bad enough, but there are ALWAYS needy people right in our own backyard. I have donated small child/baby blankets, lapghans and a few shawls to domestic abuse center (I figure the kids are traumatized too), nursing homes (something to call their own), same-day surgery center (they treat kids and indigent elders) and the hospital maternity ward (some new moms don't have anything to take their babies home in). There are other agencies that can use them - fire departments (for after fires), homeless shelters, the list goes on. 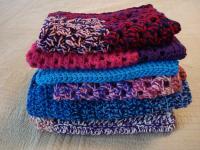 I also made some stash-busting double strand, pet blankets for the SPCA. I was amazed at the number of pet rescues and shelters in our semi-rural area. You might google "your area" and "charities" or contact churches and schools. They both have a finger on who needs what. krazy - Four were made with double strand acrylics - the other two are single strand acrylics. You can make squares, rectangles or circles, whichever you prefer. They have different types of pets so you can make different types of ghans. Here's a rough idea of sizes for all ghans - nothing in stone - do what you like. Preemies: 1-3 lbs. = 12" X 12" or 5" X 15"
Preemies: 5-6 lbs. = 20" X 20" or 25" X 25"
Babies: 30" X 35" to 40"
Toddlers: 35" X 40" to 45"
Children: 40" X 45" to 50"
Adults: 48" X 55" or 60" X 65"
Oversized: 60" X 70" or 70" X 80"